Water entering the rice breeding experiments at the Lowland Experimental Station/ Embrapa Capão do Leão/RS/Brasil. Credit: Ariano de Magalhães Júnior. Outside Asia, no other country produces as much rice as does Brazil. It is the ninth largest rice producer in the world. Average annual yields are close to 15 million tons. Rice production in Brazil is a multi-billion-dollar industry. It employs hundreds of thousands of people, directly and indirectly. Given the importance of rice farming in Brazil, researchers are working to develop improved rice varieties. "We are looking for rice varieties that satisfy farmers, the industry, and consumers," says researcher Ariano Martins de Magalhães Jr.
A new study explores the progress the Brazilian Agricultural Research Corporation (Embrapa) has made over the last 45 years. Crop breeders developed rice varieties with higher yields and improved sustainability. Magalhães is one of the Embrapa authors of the study. "We test whether the methods used in the breeding programs are helping us reach our goals," he says. "The study will also help us strategically develop and release new varieties in the future." According to the study, the Embrapa breeding program has resulted in significant yield gains. Over 45 years, grain yield improved between 0.62-0.73% each year. That translates to thousands of pounds in increased yield for farmers. 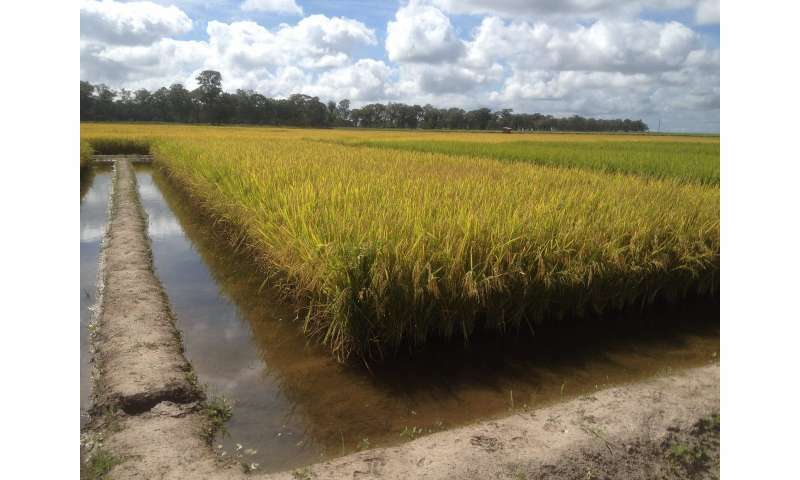 The breeding program has also developed rice varieties with reduced plant height and time to flowering. 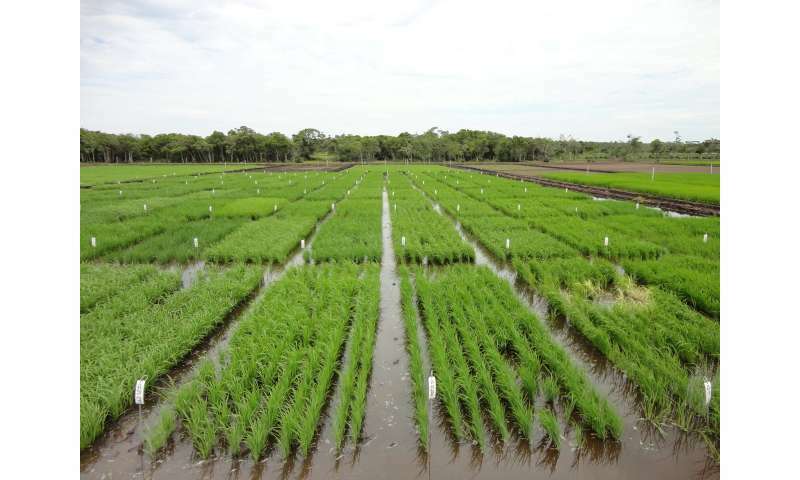 "Plant height is an important factor for rice crops," says Magalhães. "This plant architecture (shorter plants) allowed rice yield potential to double by the end of the 1970s." In 1972, the average plant was about 38 inches tall. By 2016, average plant height was about 32.5 inches. Technological Shows of rice cultivars. Lowland Experimental Station/Embrapa Capão do Leão/RS/Brasil. Credit: Ariano de Magalhães Júnior. Breeders also aimed to reduce time to flowering for rice varieties. "Early-flowering varieties are desirable because they need less water and other resources," says Magalhães. "These varieties also allow more flexibility in planting and harvesting." According to the study, flowering time was reduced by about 9 days over 45 years. It took 97 days for half the rice crop to flower in 1972. In 2016, half the crop was flowering in 88 days. The researchers also showed that rice varieties that mature quicker could be high-yielding. "Previously, the paradigm was that rice varieties that took longer to mature would have higher yields," Magalhães says. "In this study, it is evident that some varieties, which mature in 118 days, are more productive than some older varieties that mature in 130 days." Researchers also look for rice varieties that use natural resources, such as water, more efficiently. That's important because more than 70% of rice grown in Brazil is irrigated. Two southern states, including Rio Grande do Sul, account for most of the irrigated rice production. "Rice varieties that need lower inputs can bring sustainability," says Magalhães. Forty-five years is a long time, but Magalhães says the length of the study is important. "We are testing whether plant-breeding efforts have been efficient or not through the years. The longer the time frame analyzed, the more robust the data and findings." Having dependable, robust data is important. "Plant breeding is an expensive process," says Magalhães. "It requires time, hard work, and investment." Each error in the decision-making process can lead to huge losses for stakeholders. Mistakes may be irreversible in a short time span. "It is extremely important to monitor the efficiency of breeding programs," says Magalhães. "That way we can critically analyze our progress. We can also plan novel actions and strategies to develop and release new cultivars." Read more about this work in Crop Science. Antonio Costa de Oliveira also worked on the project, a collaboration with researchers at the Federal University of Pelotas.